In partnership with Hudson County Art Supply – to celebrate the opening of their new location – we invite customers to express themselves. The folks at Hudson County Art Supply have been long-time friends of D’s Soul Full Cafe. Hoboken residents may remember their location on Willow Avenue. Or maybe you shopped at their Downtown Jersey City spot on 1st & Coles. Well, now they’ve moved to a new location at 469 Central Ave in Jersey City Heights and we want to help them get the word out. 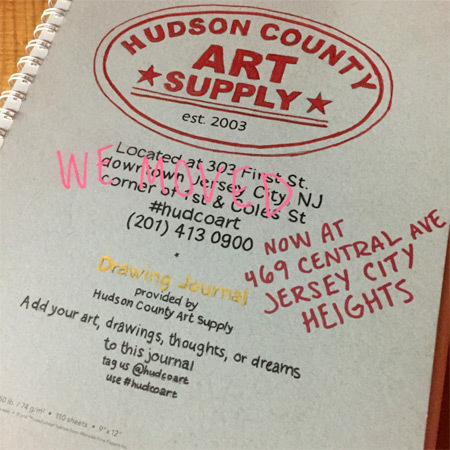 The Sketchbook Art Project was the brainchild of John, the owner of Hudson County Art Supply. The idea is to leave a sketchbook at local businesses and let patrons express themselves. He would then collect the sketchbooks and post pix of some of the more interesting creations on their Instagram. So why not let your inner Picasso leap out on the page while you wait for your favorite burrito or sandwich (or whatever)? Come by, give your creativity wings! And hey, don’t wanna wait for them to post your masterpiece? Go ahead and do it yourself. Be sure to tag both @hudcoart and @dssoulfullcafe. Plus use the hashtag #SketchbookProject. There may be a prize or two in it. Ya never know.